EJ25C Flamenco sets are constructed using a new variation of our exclusive multifilament stranded core material that dramatically improves the life and tuning consistency of the wound strings when compared to traditional nylon cores. Complimented by clear nylon trebles, this set was created and tested with artists worldwide to deliver a flexible feel while still maintaining a quick attack response that is essential for flamenco players. 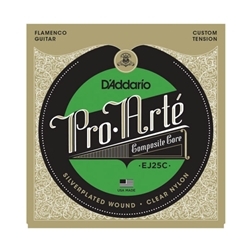 Pro-Arte Composites are constructed using an exclusive multifilament stranded core material which dramatically improves the life and tuning consistency of the wound strings. Like all Pro Arte strings, the trebles are sorted by a sophisticated computer-controlled laser machine which performs hundreds of diameter and tension measurements on every string, ensuring precise intonation.